The Salt Lake Tribune or Deseret Newspaper Deal $20 For the Year! One of the best ways to save money throughout the year is as easy as breaking out your scissors and clipping the coupons from the Sunday Newspaper. If you follow our grocery deals, you know how much money you can save by simply combining the sales with the coupons. We have worked out special discount pricing for the Salt Lake Tribune or Deseret Newspaper. 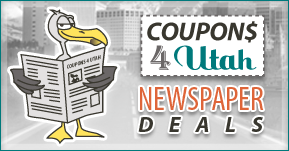 Coupons4Utah readers can get a one year subscription for the Sunday only edition of the Salt Lake Tribune or Deseret Morning News for only $20.00. Or, you can choose the weekend (Friday - Sunday) for only $39.00. No coupon code is needed. This is the lowest price for the Sunday ONLY edition of the Salt Lake Tribune or Deseret Newspaper we have ever seen. Using coupons at the grocery store on food you already buy every week is a fantastic way to start saving for extras your family needs (like college, vacations or a new house). The best way to get the coupons needed is from your Media One Sunday Subscription to The Salt Lake Tribune or Deseret Newspaper. Important note: Please be sure to read the terms of the agreement. It is recommended that you opt. out of the special editions immediately after your first paper arrives. Not doing so will shorten your subscription immensely. If you have any questions our rep, will be happy to answer them. You can contact her through the information listed on the subscription form. Redplum Coupons Now a Permanent Addition to the Newspaper! Is this deal still available? It still says 2017 on the form and I only see the $39 offer, the Sunday only for $20 is not listed. Never mind about the $20 Sunday only link, found it, but the deal is still going on? Is this offer still valid? Like can I sign up today and start getting these papers? DOES THE $20 RATE INCLUDE ACCESS TO THE ONLIE EDITION OF THE SL TRIB? IF SO, IS THAT FOR ONLINE ACCESS AT ANYTIME? Hi! I signed up for the Tribune about a month ago, and everything is going smoothly except today I didn't get my paper. I can't find the phone number I'm supposed to call, so can you provide it here? Thank you so much! Will we be able to renew our subscriptions at the $20/year rate for Sunday only? How do we go about doing that? Thanks! You have to go 30 days without a subscription, then you can sign up again at the lowest available rate. Hi Lisa, Once your subscription begins you'll need direct all your questions to the Trib. If you're getting notice for renewal already it's likely because you didn't cancel the special editions as mentioned and recommend in the post. Not cancelling them will shorten your subscription substantially. Hopefully that helps. I was looking for special offers for the Salt LakeTribune and this was the first link that came up on Google. Is there any chance that it's still valid? Yes, we keep the info on this post updated at all times. When it expires we'll mark it expired. So glad you found us. I signed up for this in February and opted out of the special edition papers. I just received a bill saying that I need to renew. It only lasted 6 months!! Any ideas on why? Read the fine print for the newspaper subscription. It says included will be holiday and special papers at $3.00 each. If you want to opt out of those you have to call them. Yes, you will definitely want to be sure to opt. out of those otherwise you subscription is shorten by quite a lot. How long is this deal available? Cannot sign up til next month. It should still be available then. I haven't received notice that it's changing. Are the coupons only in the Sunday newspaper? Can you get another day? Thanks! If I currently have a subscription to the newspaper, will this overlap? Or can I put the new order on hold until the other one expires in the summer? You can add another subscription to your existing one (up to 4 total papers). If/when your current one expires, you will have to wait 30 days before you can take advantage of the promotion. Hopefully that makes sense. You can also contact Alison Andersen at 435-720-2103 for more specific questions. Hi, I am super late on seeing this. I am wondering if this deal is still going? If is is still going I am wanting five or six Sunday papers, can I do that? If this is still going is there a phone number I can call to subscribe? Thank you! Hi Triniti, Yes it's still valid, just fill out the form and a rep. will call you. I live where we don't have newspaper carriers can I get a subscription through the mail to my PO box. Thanks. To my knowledge they don't mail the Trib or Deseret News. will the thanksgiving adds and coupons be delivered in the Sunday only option? Yes however, I strongly recommend you read the full terms. They will charge $3.00 for those and that will decrease you subscription time by a large amount. The best way to get the most bang for you buck would be to purchase the Thanksgiving paper at the store or gas station and cancel the special edition offers. I signed up for sunday only last fall. My paper stopped being delivered last sunday. I called to report and they said I was past due so they stopped it. I just paid them $14.67. So my subscription did not last a year. Has something changed? Yes, something did change. A short while ago they changed their terms and they are posted above. They started delivering 'special edition" papers and if you don't opt out of them you are charged $3 per edition. They don't bill you, but it shortens your term. Because the newspaper special is $20 for a year (or $.38/week) 1 special edition billed at $3 will shorten your terms 7-8 weeks! You can call them to get a credit. When you signed up last fall, these terms weren't in effect and you did not agree to them. Call 801-204-6100 and let them know this and to credit your account for those papers. Sadly everyone that gets the paper will need to call and opt out so their terms aren't shortened. So the daily herold has the red plum coupons only? Are they the same red plum coupons that come in the mail? And the salt lake tribune and Deseret newspapers offer the same coupons so it doesn't matter which one I pick? And those coupons are the smart source and p&g coupons? Am I understanding all that correctly? Hi Eryn, For most of Utah with exception to Utah County the Red Plum coupons come in the mail. I assume they are the same Red Plum coupons as what comes in the Herald. I'm not sure if the Herald has Smart Source and P&G in it. I would suggest you call them first. The Tribune and DN both do have Smart Source and P&G, they don't have Red Plum. Hopefully that helps. the smart source and redplum coupons are the same as you get in the mail if you request them from those websites the news paper only adds the P&G brandsaver that can only be obtained in the paper , however you can utilize digital coupons from almost any grocer via your loyalty card, they list the very same coupon discounts that news paper have and do not stack with paper coupons so save your printer ink, and do not throw out money on a paper if you have internet access at home, if you intend to shop at Walmart use their instore app on a smartphone to access coupon discounts if you are not tech savvy and are not shopping at a loyalty card store then you likely will benefit a great deal from paper coupons. P&G will mail you larger discount coupons that have a longer time available to use if you take advantage of rebate offers , sign up online to review samples and interact with them via emails for product information . News papers are not the most efficient source of coupons anymore however in many instances it still can be an attractive option . Redplum automatically comes in the mail for most people in Utah on Tuesday. They aren't in the newspaper. To my knowledge the only legitimate way to get SmartSource is in the newspaper. Did coupons get sent out yesterday?? I did not receive any newpapers...Do you have any advise? I got a Smart Source in yesterday's paper. Is this deal still working. Thanks!!!! Yes, this deal is still available. We keep the post up to date with the current available pricing and information. Is this deal still working?? its OCT 27, 2014 today. Thanks! Does the Red Plum come with the Deseret Newspaper Sunday edition? No, most Utah areas get that in the mail in Tuesday's ads. If you live it Utah County, it's in the Daily Herald. Hi Tia, I'm not positive, but I believe the Redplum comes in Sunday's Daily Herald for Utah County. You'll want to double check with them if you subscribe. I get the Red Plum coupons in the daily herald. Do you get those as well in the tribune? just to make sure I read correctly only the sunday paper has the coupons and for just the sunday paper its 20$ for a year subscription. is that correct. Yes, the Smart Source and P&G coupon booklets come in the Sunday paper. And yes, the Sunday only paper is $20 for the year. You can order up to 4 copies for that price. Sometimes other offers come in the weekly edition, like Kohl's coupons and coupons for various other local events. But, the grocery coupon booklets only come in the Sunday paper. So I first have to cancel my current subscription? Then how long do I wait before I can sign up for this? If I give my credit card info only to a Media One rep, am I required to fill in the credit card info on this form? Thanks! I just got my first Sunday paper delivered but found only two coupons. Coupons really are the only reason I signed up. Are there some Sundays better than others or did I not get the coupons? There are 4 or 5 times a year where they don't put coupons in the paper. It's not the newspaper, it's actually the coupon booklets themselves aren't printed. Last Sunday was one of those weeks. You'll get coupons next Sunday. For $20 you get a paper every Sunday. You can have up to 4 papers delivered each Sunday. That would be a total of $80 for 4 Sunday Papers delivered every Sunday for one year. Hi Jared, Yes this is still available. Media One requires that one of their designated reps collects your credit card number. The sign up sheet is still active, can I order a paper at this rate still? Hi Jarney, Yes, this offer is still valid. This is a stupid question. My subscription expires in 3 weeks. Can I sign up for the $20 addition now and then cancel the original one when it expires? I'm pretty sure that will work. When our rep Alison contacts you make sure to discuss that option. BE sure to fill out the form BEFORE your subscriptions expires. How long is this deal going to be good for? I just cancelled my subscription last week so I can't get it for almost another month. They would not specify an end date. But, I believe it will be around for a while.